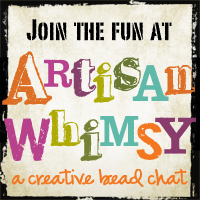 All the Pretty Things: Bead Peeps - Swap 'n Hop; the reveal! The time to reveal the Swap 'n Hop has arrived! Welcome! For a reminder of what I received and what I sent to my lovely partner, Maire of Thistledown, please check my previous post: Sweep 'n Hop ~ my partner. Maire sent me a whole box full of treasures and there was no way I would use everything. However, I tried my best to try a little bit of everything. First in line was the ceramic cylinder. I had 2 of them, in a bluish - purplish shade. 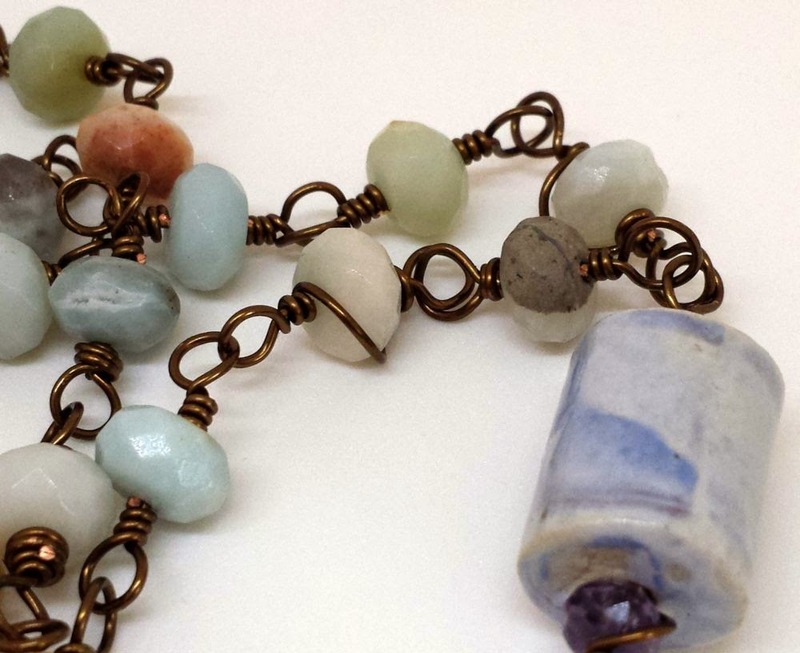 I looked for some sort of gemstones to add and I found this strand of faceted amazonite. A tad towards greenish-bluish, but with some grey veins that went well with the purple. I added 2 of the purple crystals from Maire's stash, as 'bead caps' for the ceramic cylinder. Then I figured out a tassel is requested and used some of the waxed linen from a previous swap to achieve that goal. 'Universe' was born - I love this universe. So far I had used one cab, one ceramic bead, and a couple of crystals. The content of the box was looking back at me, reproachfully. I could hear the beads asking 'is that all you can do?!'. Alas, I knew I can "do" more, had only I had time. Then I decided time will be made for this and I picked up the brass leaf made by Maire herself. Good - what next? I spilled my 'everything I need' box (it's a big Ikea cube, filled with boxes that contain: tools, wire, beads, and more... all I think I can use in one session at the jewelry studio) looking for something to match. 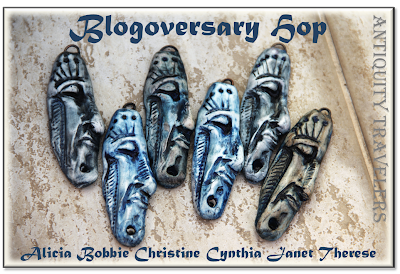 I came across the polymer clay beads by Elaine Robataille (a fellow Canadian), the ones I received in last year's Bead Soup swap (the linen from the 'Universe' is from the same swap). Ah, things started to get shape. 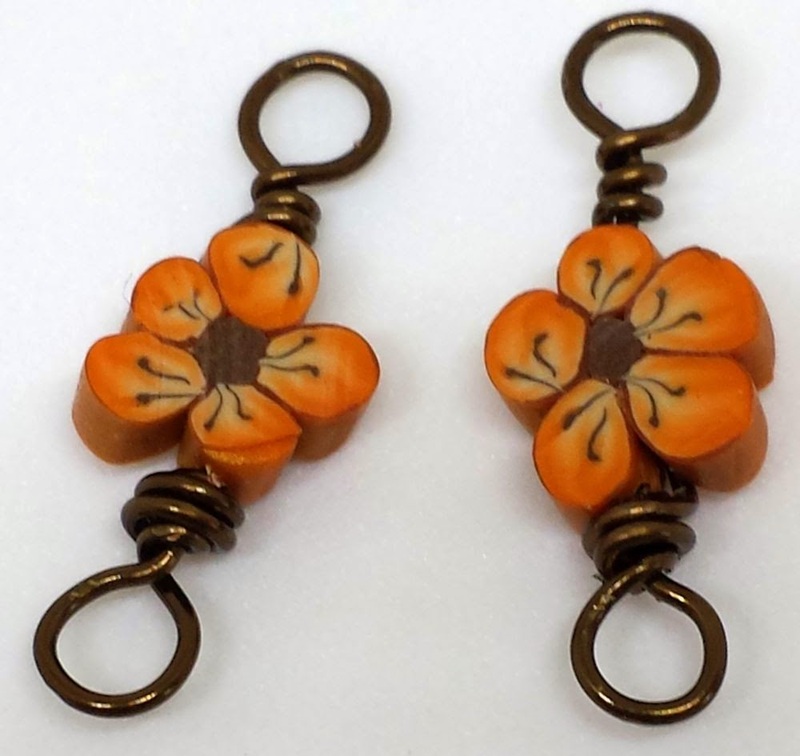 But brass and orange didn't make for a very cheerful combination. And I needed sunny and cheerful. Out came the bright yellow seed beads Maire sent and a brass branch. Now we were talking! I decided this will be the focal. What to do for the rest of the necklace? Adding the brass branches, to have a nice link to the focal. Still a bit too serious and sad. 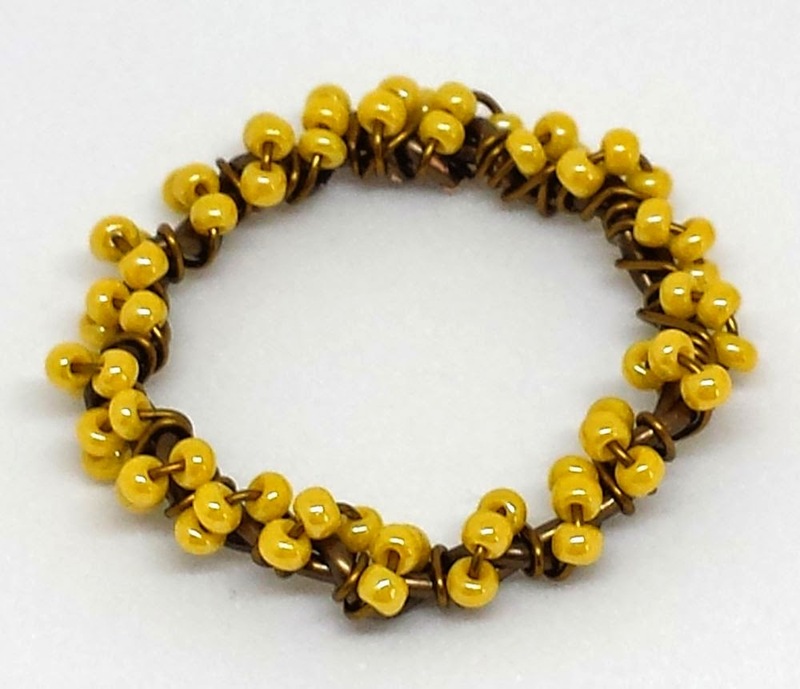 Ah, yellow seed beads to the rescue! Now this is more like spring: forsythia-like branches and orange blooms. Doesn't it look like candy? I still had the neckpiece itself to make. I picked up Maire's sari silk, which was now matching the whole thing perfectly. But it was too much yellow, and in my life everything must be in balance. Luckily for me, from a few good years back I had a small leftover piece of orange sari silk. Ah! Now that's what I call perfection. 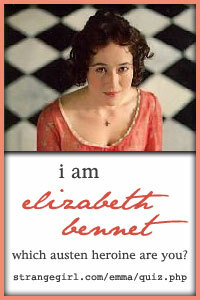 The necklace itself received the very appropriate name of 'Nature in bloom'. I would like to take this moment to thank Maire again - it was very nice meeting her and leaning more about her; the lovely package she generously sent gave me lots and lots of ideas (I still have pieces to use, obviously! ); which is one of the reasons I participate in these challenges. Working with items someone else picked for you is very interesting and a sure way to start your creative juices flowing. 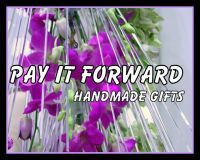 Thank you to the hostess of the swap as well, I know there is an incredible amount of work behind these challenges, and I am thankful to all who take upon themselves the tasks of 'herding' an insane amount of people. Lastly, I would like to thank you for stopping by - please leave me a word if you're inclined to do so :) And before you leave, please ensure you will visit the others too! Marie Covert http://thistledown-and-swaddlings.blogspot.com/ <- my partner! Alicia Marinache http://www.allprettythings.ca <~ you're here! All are simply gorgeous Alicia. I love, love, love that necklace with the yellow and orange. You have such great talent! First of all, Thank you, Alicia, for all the wonderful items you sent to me, they have given me a refuge from all the craziness going on in my life right now. They gave me a place to focus as well as being beautiful! Second, I knew you would do something wonderful with the brass leaf, I just had no idea that you would create something so bright and fun and so very, very pretty!! ... No, I knew you would!!! I love your work and knew that you were brilliant, this proves it!!! 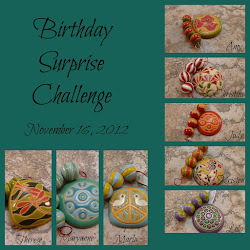 Third, the necklace that you made with the ceramic is great! 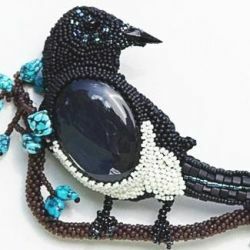 I love those beads and had no idea what to do with them!!! I wish I had more to send, I know you would have made a whole collection out of them! and lastly...that mokume gane cabochon is a bugger I know, but the wire work you have done is great, the shape is perfect for the cab... maybe in silver?? I think the green beads will be perfect with it! I appreciate you being my bead partner, and appreciate the time you spent on the pieces that you have done, they are brilliant! I hope you have fun with the other stuff when you have some time to work. I hope everyone remembers that you did all this work in a very short amount of time, which makes it all the more brilliant!!! I agree with Linda Younkman, You have a great talent!! 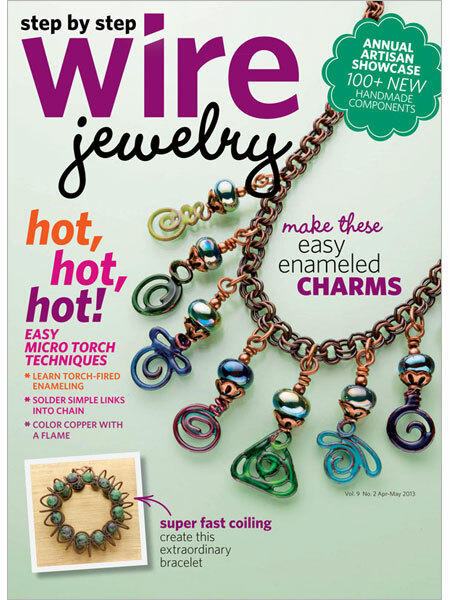 I really enjoyed reading about how you made each component for your necklace. I love how all the parts come together with your stunning constructed pendant focal. What a fun stash of beads you received. I love the "Universe" necklace. What great designs! I really love the Universe necklace but enjoyed hearing about your design process. 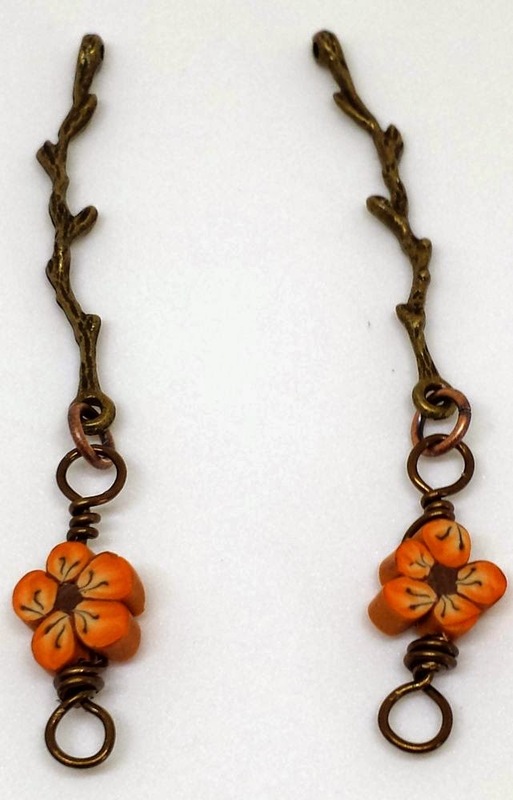 Your two necklaces are amazing, but I love the Nature in Bloom, I love orange and yellow. Hi Alicia, Yellow and orange are my two least favorite colors but you have made them look wonderfully appealing in your necklace. 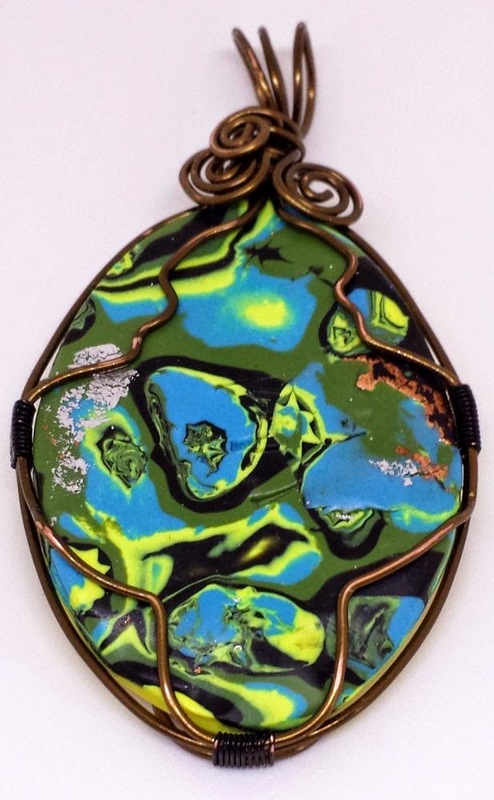 I like the ceramic focal necklace too and I am sure you will find a way to make the mokume cab work too. You are very talented. Oh my goodness! That necklace is TO DIE FOR! I LOVE the yellow circle of sunshine...and the sari silk....and the branch connectors.....and....and....and.....all of it! Just SPECTACULAR! Beautiful pieces! 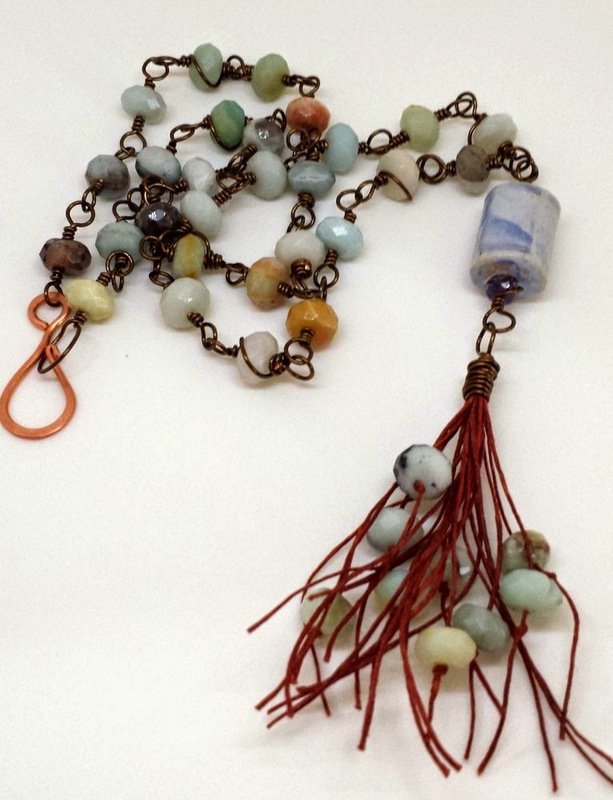 The Universe necklace is so pretty with the Amazonite beads and the ceramic barrel focal bead and tassel. 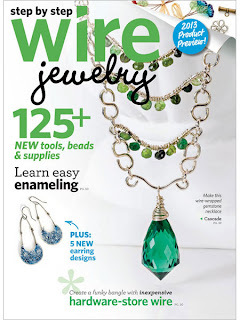 I like the wire wrapped cabochon, but I do agree the wire blends into the cab to where you do not notice it as much and those are the perfect green beads to go with the cab. Your third piece is gorgeous so bright ad pretty I love it. Seeing your designs is always a highlight of any Hop. The first piece is beautiful, but the second necklace... WOW! Amazing job! mmmmmm.......So I made a comment and it disappeared on me....so if this is a repeat I apologize! Love how you showed that last necklace piece by piece and the finished necklace a show stopper. Amazingly beautiful work. Amazing designs! I really love the design story and finished product on the second necklace...so interesting to hear your process for getting to just the right combination. Great job on everything! Your colors were fairly similar to mine! Great job on all your pieces.. 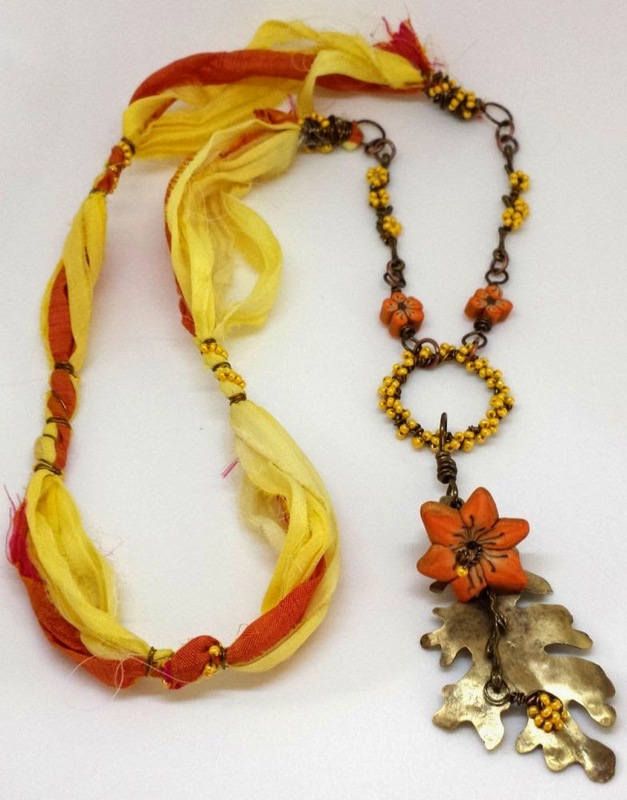 Loved the orange & yellow necklace with the brass leaf.. Isn't it fun when all the components merge together and create a special design ! 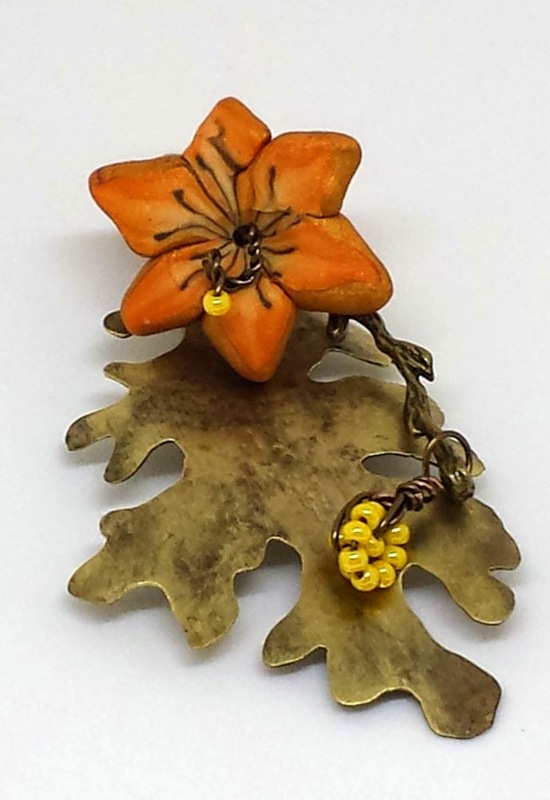 Your Nature in Bloom is one of those special pieces . OMG that last necklace is out of this world beautiful!!! Can't get over how gorgeous it is. Perfection indeed! 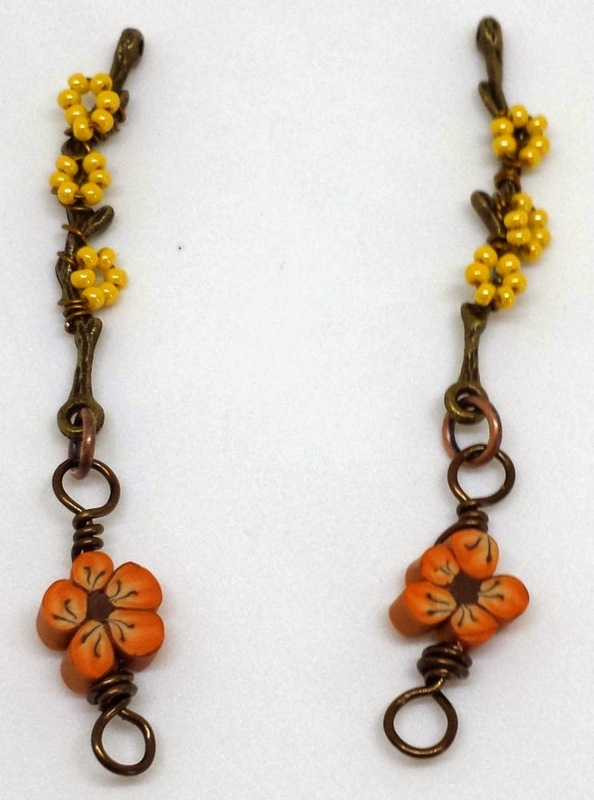 It was fun reading how you created the yellow and orange necklace and all the details that make it unique! The tassel in the first necklace breaks the mostly monochromatic overall look. 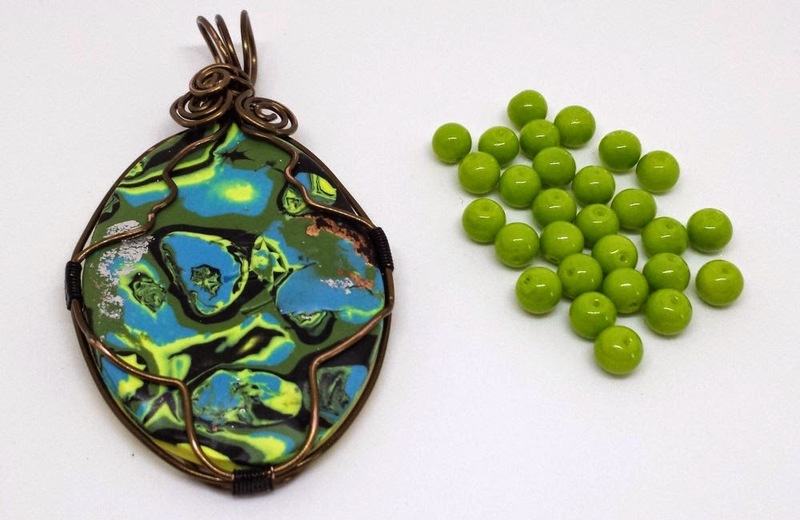 I like the wire wrapped pendant and the green beads go well with it. 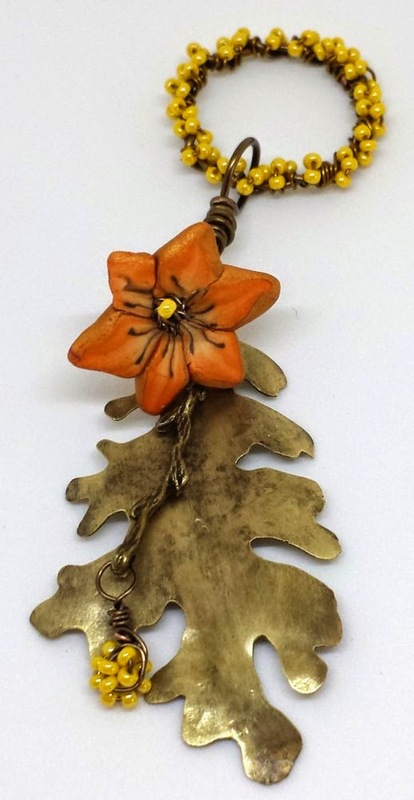 All your pieces are so pretty but that Nature in Bloom Necklace is really special. Love it!